Technology has propelled the financial sector to great heights. Innovations that dawn upon the space beam the light of transparency and efficiency on end consumers and enterprises alike. Thriving crypto currency networks based on the revolutionary block chain technology could one day redefine financial transaction as we know it. The coming of artificial intelligence has laid new focus in areas such as client contextualization, operational efficiency, and risk mitigation. To make the communication factor better, the evolution of Chatbots has shown promising results that could potentially change the way the FinTech landscape is being perceived. Also, the abominable effect of security threats has led to organizations doubling up their stance on the security front. The year 2018 is expected to see more financial giants releasing apps for better access and communication. As such, the FinTech arena is filled to the brim with countless solution providers, which makes it a very cumbersome process for a CIO to choose the right solution provider. To make this task easier, CIOReview proves itself to be a beacon in the FinTech industry. Our distinguished selection panel, comprising CEOs, CIOs, CTOs, industry analysts and the editorial board of CIOReview narrowed the final 50 providers that exhibit competence in delivering FinTech solutions. 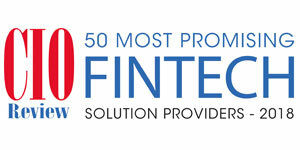 We present you the CIOReview’s 50 Most Promising FinTech Solution Providers - 2018.